To Continue Our Story . . . 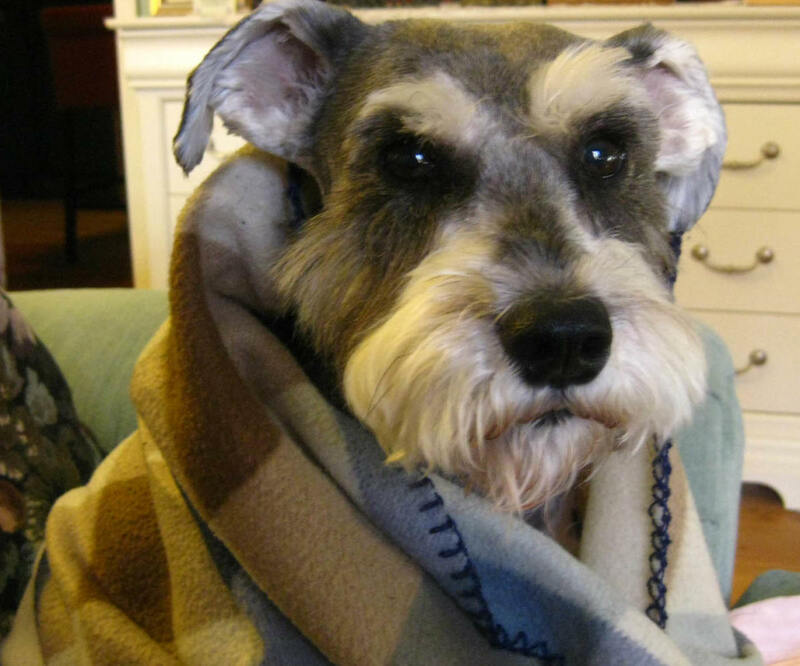 This is my personal experience with discovering that my beloved miniature schnauzer had developed a condition called Keratoconjunctivitis Sicca, or "dry eye." 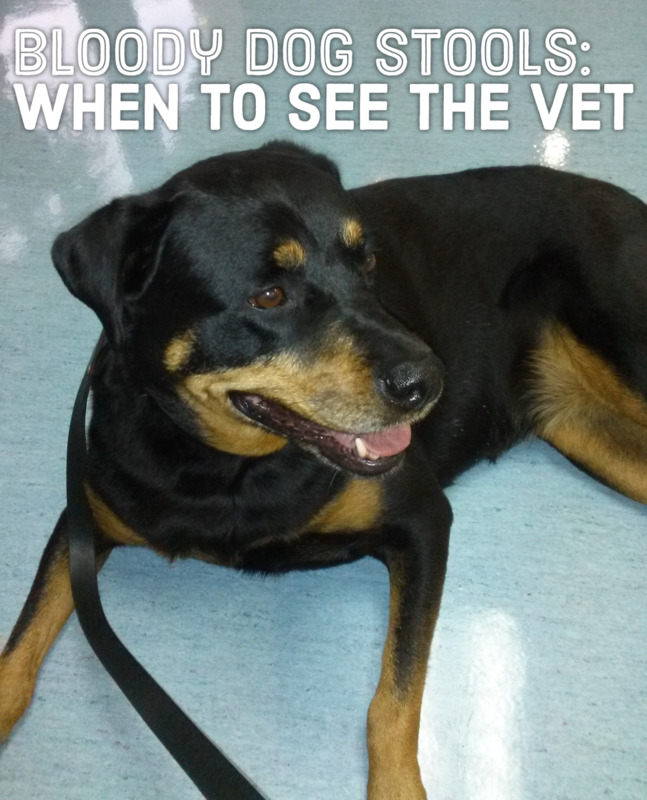 It has been a long journey, with many visits to the veterinarian and some difficult decisions about medical care. Along the way, I learned volumes about this condition, available treatments, and how to help keep a dog comfortable when they have it. I divided my story into two separate articles: (1) what happened leading up to my dog's diagnosis, and (2) this one--how we learn to live with the disease. I used the word "we" in that last phrase because both Puppy Girl and I were required to make adjustments. If you have to contend with KCS, I hope you'll find some support by reading both of these articles. 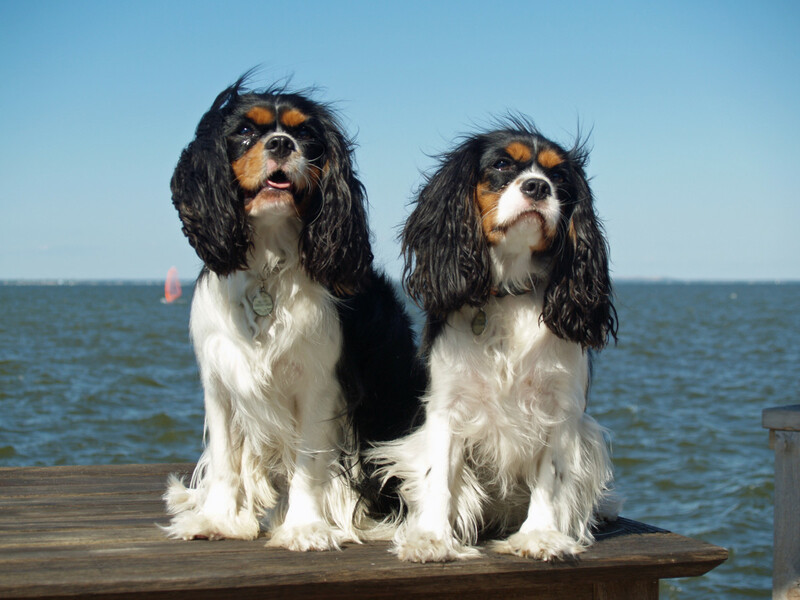 Even if your dog does not have the disease, it's helpful to learn about canine disorders that may affect many breeds. When I next took Puppy Girl to the vet clinic (sooner than her scheduled appointment because her eyes still looked very bad), treatment with the cyclosporine drops was not stimulating her lacrimal glands to produce sufficient tears, and the secondary infection was lingering. Sometimes she could barely open both eyes; at other times, only one. The examining vet, Dr. Thrash, agreed there was no real improvement and said she considered this case "one of the worst I’ve seen . . .” She felt justified continuing the PNB ophthalmic antibiotic ointment to alleviate the persistent secondary infection, while changing from cyclosporine drops to tacrolimus, a drug with the same mechanism but 100 times more potent. This newer canine medication had shown success when used for dogs that didn't respond to cyclosporine. Because my dog's eyes were so very dry, Dr. Thrash didn't want to wait a few weeks to discover whether or not the cyclosporine would begin working. In addition, she asked if I'd like for her to refer Puppy Girl to a veterinary ophthalmologist. She said that when dogs don't respond to treatment, there's a surgical procedure that re-routes the salivary gland to the eye. Saliva isn't a perfect "fix" to lubricate and clean the eye, and the procedure has its drawbacks, but should be kept in mind "just in case." I agreed, and she made the appointment for us. Puppy Girl and I went home with the two meds, and she went straight to her soft floor pillow to recover from vet clinic-induced "trauma." I put her special CD of soothing slow-tempo music on to play. It was developed to calm nervous dogs, and I play it for her a lot these days. Meanwhile, I headed for the computer. Whenever a new diagnosis or prescription drug is introduced into my family—and when I use the word “family” I include myself, my immediate and extended family, close friends, and, yes, my dog—I spend time researching reputable medical sites for as much information as possible about the medical issue, potential complications, long-term prognosis, drugs prescribed and their possible side effects, and other available options. I’m teased about my research proclivities, but I feel more secure when I'm armed with the knowledge to make sound decisions during what may be an emotional time. I’d already researched KCS and cyclosporine. I wasn’t pleased about using the cyclosporine, because it’s a canine ophthalmic version of the drug used for humans to prevent rejection of organ transplants. Its mechanism for doing so suppresses the immune system—specifically inhibiting T-cell proliferation and preventing the release of pro-inflammatory cytokines. T-cells are like policemen that patrol the body to stop invading bacteria, other pathogens, and abnormal body cells. 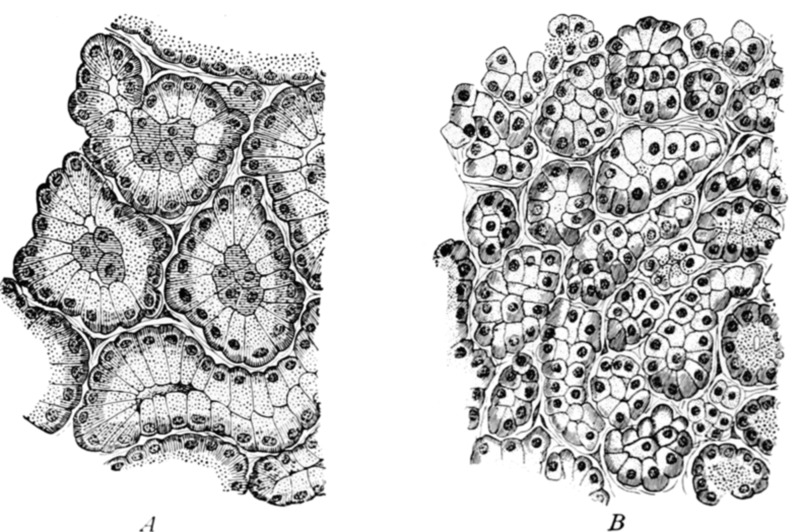 The latter may later develop into cancer without the intervention of T-cells. In other words, this drug that stimulates tear production to some extent in 80% of dogs treated may also suppress the dog’s natural ability to fight off dangerous infections. Although most of the sites recommending use of either cyclosporine or tacrolimus state that very little is absorbed into the bloodstream, excuse me if I’m skeptical about that claim. I’ve witnessed the recall of too many drugs by the FDA because of serious side effects (including death, which I consider very “serious” indeed). Often these dangerous drugs were allowed to remain "approved" far too long before the recall. One prominent veterinarian with a Ph.D. wrote on his website that there is no reason to believe the use of cyclosporine and tacrolimus will not cause health issues with dogs in the long term just as they occur in humans, i.e., cancer (particularly lymphoma and skin cancer), kidney disease, liver disease, infections such as bacterial pneumonia, and the virus that causes warts. The reason I paid close attention to his article was because, within a week of cyclosporine administration to Puppy Girl’s eyes, she developed a lesion just above one eye that looks like a wart. It wasn’t visible through her long schnauzer eyebrows (the “awning”, as I often refer to them), but those eyebrows had to go. 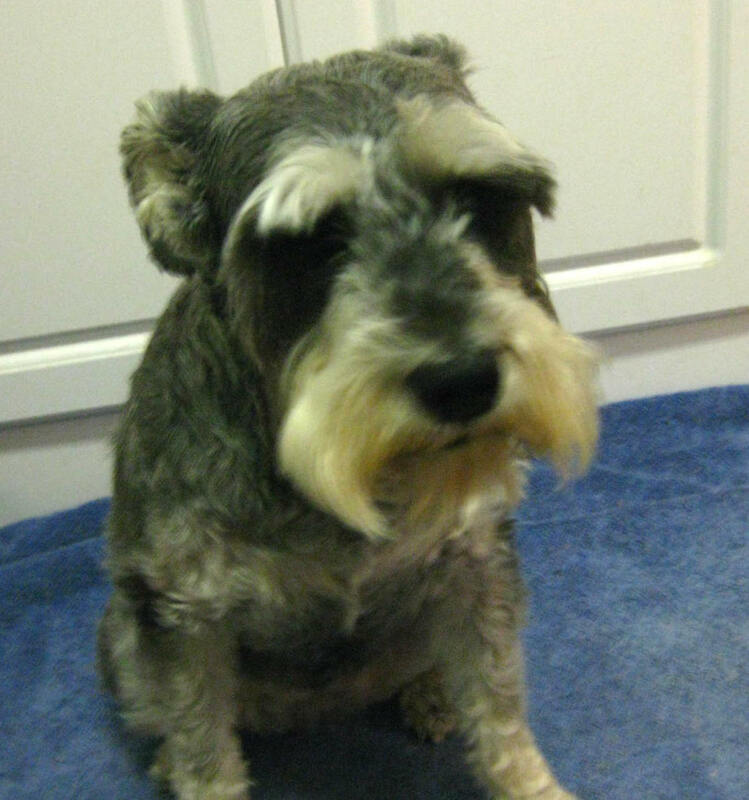 Those Schnauzer hallmarks—the eyebrows, long eyelashes, and the hair on her face—were all obscuring the treatment area and making it difficult not to spill medication into the hair and on her skin (not good). I made the decision to have her face completely shaved to facilitate administering meds to her eyes. I must admit, I got a bit teary when her hair was first cut, so drastically changing her gorgeous schnauzer “look,” but I soon grew accustomed to her new appearance. The shaved hair definitely makes it easier to apply medications, so it serves its purpose. I never realized how well-shaped her face is under all that hair. She's still beautiful to me! I used the tacrolimus ophthalmic drops for about a week, and they seemed to be helping some—not much, but my dog's eyes looked better for about an hour after application, so I assumed the medication was stimulating some tear production. I still had to put GenTeal lubricant in her eyes frequently, day and night. Between 11:30 or midnight, when she was "doctored" for the last time before I went to sleep, and her normal wake-up time of 7:00 a.m., her eyes were "glued" shut and had to be gently cleaned with warm water and a soft cloth first thing in the morning. Even after one drop of tacrolimus in each eye, it was several hours (and more GenTeal ointment) before she opened her eyes fully and faced the light. Then something happened that "stirred the pot" and made the whole situation worse. I'm old enough to remember the old black-and-white TV sitcom from the mid-century (the twentieth, that is), "The Life of Riley", starring the late William Bendix. One of the character's favorite sayings when faced with problematic issues--of which there were many in every episode--was, "What a revolting development this is!" I knew just what Riley meant the day I opened an envelope from the pet insurance company that took my $51.88 premium each month. They had already denied other claims after arbitrarily attaching a "secondary diagnosis" of "allergy," even though the vet sent statements to the contrary and I appealed . . . simply because my dog once had dermatitis due to one flea bite! She's never had another flea on her since, or experienced insect bite dermatitis, and the problem in question had nothing to do with an insect bite of any kind. I was already not happy with this insurance carrier, but I thought, At least, they can't call KCS a pre-existing condition since she was only recently diagnosed, and she'll have coverage from here on out." They didn't. They just paid me a very small amount of one claim (after the $50 deductible for each incident) and informed me I'd reached the maximum payout. Since I thought the annual maximum (minus deductibles) was $14,000, I called and asked a customer service agent what the explanation of benefits meant. 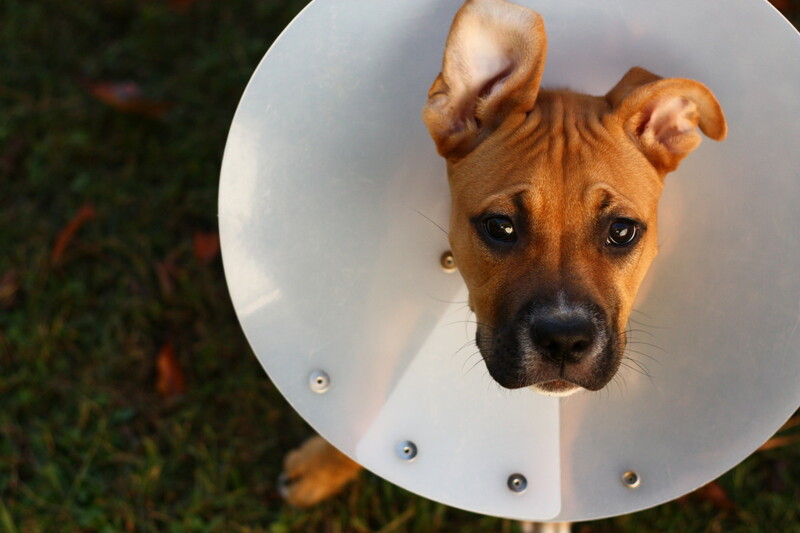 That's when I learned for the first time—as there was no information about it in the policy I was sent—that this company establishes maximum annual amounts payable for a long list of dog illnesses. With KCS, this limit was $120—less than one visit to the vet clinic! Since it was obvious this policy was worthless, and KCS would now be considered a pre-existing condition if I tried to change carriers to get a better one, I cancelled the policy. I decided to put the amount of the monthly premium toward her vet and medication expenses, as well as save some extra each month for Puppy Girl's future "health expenses fund." Now that I didn't have any pet health insurance at all (instead of just having worthless pet insurance for which I was paying too much), the appointment with the veterinary ophthalmologist loomed large. I'd already had second thoughts about taking PG to see this specialist, anyway. After the appointment was confirmed, I spent a couple of hours reading an online forum about the topic of KCS and the parotid duct transposition, the surgical procedure PG's vet had mentioned as a "last resort" if the meds didn't work. The forum thread began in 2006 and continued through mid-2012, with pet parents weighing in on meds, treatments and—especially—the effectiveness (or not) of re-routing a dog's salivary glands to serve as substitute tears. 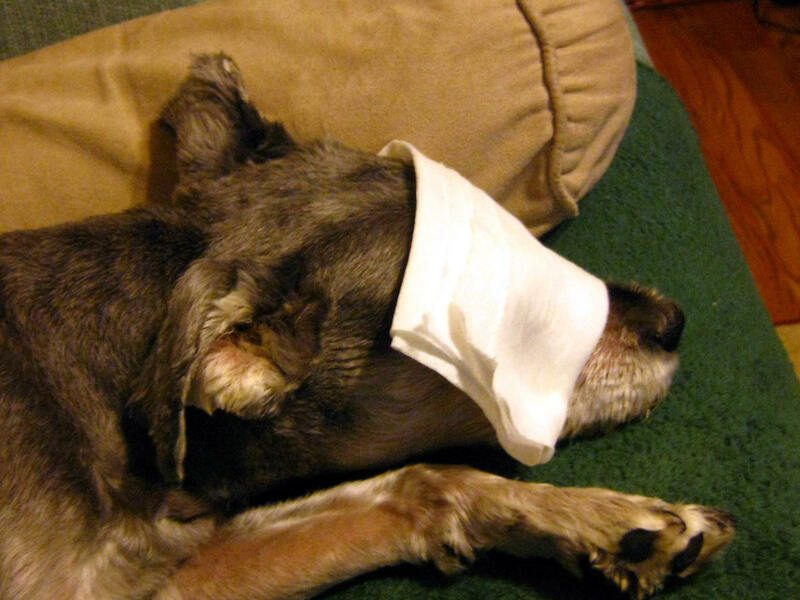 The general consensus (there was only one person on the forum whose dog had a "successful" parotid duct transposition) was "Don't do it unless the dog is in terrible, unceasing pain and losing one or both eyes!" Everyone (with that one exception) whose dog had undergone the surgery required near-constant cleaning of the face. 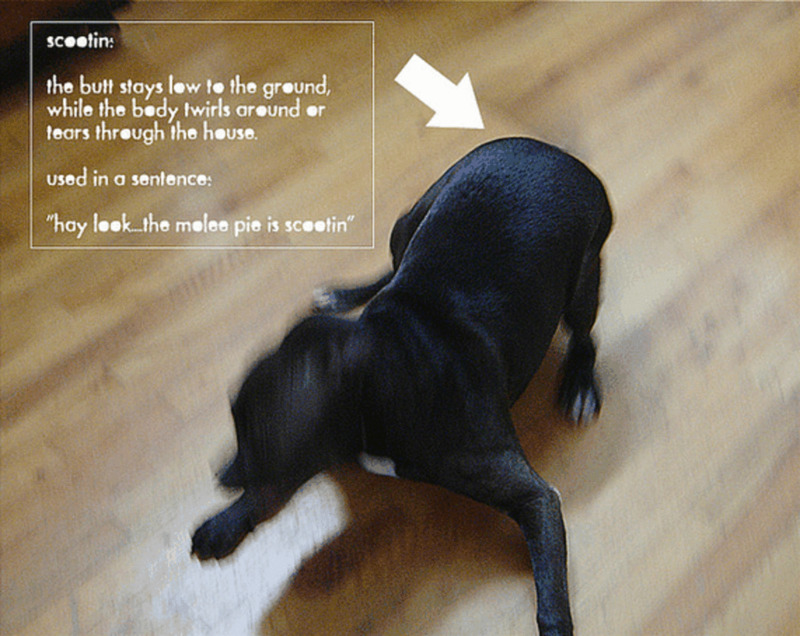 Any time it smelled or ate food, the salivary glands dumped liquid in the eyes, and it poured down the dog's face. Formation of salt crystals over the cornea was anything but rare—they were practically a given. These hardened crystals required more surgery to remove, often multiple times in a dog's life. The clincher was that the dog would still need lubricants or drops all through the day and night because saliva is not as effective as real tears to clean or condition the eyes. Thus, my mind was already made up against the surgery, especially since there was slight improvement from using the tacrolimus. Many people on the forum said not to give up too quickly on cyclosporine. It sometimes took up to twelve weeks or more to "kick in." One woman wrote that her beautiful collie developed a cancer after taking tacrolimus a few months. That information helped me with my other decision. Okay, this is what I would do: (1) I'd cancel Puppy Girl's appointment with the specialist. (2) I'd stop using tacrolimus immediately and switch back to the cyclosporine (not as strong as the former, so perhaps more safe for longer-term use). It seemed logical to me that, with the start Puppy Girl's tear production had experienced from the week of tacrolimus treatment, use of the cyclosporine might keep the tear duct stimulation going. And that's exactly what happened. I switched that day, and within two days could be sure there was no difference at all. My dog's eyes still didn't have a normal amount of tears, and the cornea still looked somewhat cloudy, but they were better than before treatment began. That level of improvement was stationary at that time. I gathered up my courage and e-mailed the vet who referred PG to the specialist, telling her of both my decisions, as well as the fact that I no longer have pet insurance and why. She was very understanding. The vets who normally care for Puppy Girl, Dr. Thrash and Dr. Camp, are terrific veterinary professionals who truly care for their patients—and their patients' humans. Puppy Girl will be returning to the vet clinic soon for a checkup. She may be placed on a regular schedule of visits to ensure her corneas don't scar or any other major problem threaten her eyesight. She rarely acts as though she's in pain—only sometimes right after awakening in the morning. I can tell when she's in discomfort because she will whimper ever so slightly when preparing for the cyclosporine treatment. I have to strain to hear it, but after the initial sting of the drops (the medication is compounded in a base of olive oil), she begins to open her eyes wider within the next half hour and acts as though she's more comfortable. I'm trying to get accustomed to routinely waking at 3:00 a.m. to put more GenTeal ointment in her eyes. You see, her eyes don't close tightly when she sleeps, and the ointment obviously evaporates before morning. Just like me. You see, I can understand what she's going through because I have blepharospasm, and a surgical procedure I had for that condition 20 years ago keeps my eyes from closing tightly when I sleep also. Every night before I turn out my bedside light, I use an ophthalmic ointment. Just like Puppy Girl. I switched from the brand GenTeal for my personal use to Refresh P.M. to avoid the possibility of getting our respective tubes mixed up and causing cross-contamination. They say that dogs and owners who live together a long time often grow to look alike. With my hair graying, I already share that characteristic with Puppy Girl. Now we have similar eye conditions. This is a true story. You couldn't make up something so bizarre! I know from personal experience what it is like to live with an incurable, though treatable, medical disorder. The paramount lesson I learned is that something which seems devastating and insurmountable in the early stages eventually begins to seem like just another part of your life. The adjustments that feel so difficult at first become much easier as time goes by. I expect Puppy Girl's KCS to follow the same path—for me, at least. I'm already adjusting to the changes her eye disorder made in our lives, and observation leads me to believe she's accepting the changes, too. She seems more resigned to her treatments, and she's stopped hiding from me. When she "asked" for a tummy rub, that was icing on the cake. It would be great if I could end this story with a totally happy ending that included a cure. Since that isn't possible, I want readers to realize that it still ends on a positive note. My girl is closer now to her pre-KCS behavior, and I'm feeling more confident about caring for her chronic disorder. We're going to be okay! Relaxed too soon . . . So much for my optimism! After three months, Puppy Girl's regular vet determined that her lacrimal glands were not being stimulated by the drops that were supposed to make tears. She was referred to an ophthalmology veterinarian, and I told him on our first visit that I would not consider the surgical procedure. Although tests showed she still had no tears, he prescribed a combination of cyclosporine and tacrolimus to be put in her eyes daily (one drop each eye) to prevent inflammation. Her KCS is not "curable," but he reassured me that he uses these drops with many dogs suffering from the condition and has seen no ill effects from the medication's use. The "jury is still out" with me, but I'm using it for now. At the specialist's instruction, I continue to place GenTeal nighttime lubricant in her eyes periodically throughout the day and evening until after midnight. It is obvious that the thick ointment blurs her vision, but it protects her cornea and prevents painful corneal abrasions. Therefore, our schedule (Puppy Girl's and mine) remains established for life, with routine veterinary checkups of her eyes. I searched online to find the best price (with free shipping and no tax) for the ointment because the tubes are very small and are emptied in two or three days. In the summer of 2013, after a year of chronic KCS, Puppy Girl lost her eyesight. In spite of a strict regimen of frequently cleaning mucous from her eyes and applying Genteal P.M. eye ointment to both eyes no less than every two hours day and night, she was diagnosed with scar tissue on her corneas and rapidly progressing blindness. This was heartbreaking for me, but I determined to do everything possible to help her adjust. You can read my account of how Puppy Girl reacted to going blind and her ongoing adjustment. Her regular vet discussed potential bilateral enucleation (removal of both eyes) to ensure that she doesn't have any pain. This is a very difficult decision for a pet parent to make. The very thought of having her eyes removed is traumatic to me, but not as much as if she weren't already blind. I've read accounts of the benefits of enucleation (which is used for a variety of diagnoses) on a support website for people with blind dogs, and they're encouraging. Thanks to my HubPage readers for your kind comments and for caring about dear Puppy Girl! There are two (perhaps more) medications that may help. I hope your little pug responds to them. Be sure that you keep her eyes lubricated, especially when she's sleeping. GenTeal PM eye ointment (for overnight) works for dogs the same as it does for humans. Hope all goes well. I have just learned that my little pug has KCS. Now I have read warm compress is good. So is it warm or cool? I also ordered optixicare for eye drops? They are starting her on meds which are being shipped . This all very new and scary. She doesnt want to play and shes not herself. I hope theres some improvement with the right meds. I would like to share a story of Chips, my 8 year old Jack Russell who mysteriously got KCS in October 2017. We were traveling and put our 3 dogs in a kennel for a week. When we returned home he showed signs of conjunctivas and dog flu. He wasn't getting better after a week so we took him to the vet, who gave us drops. He is a terrible patient and would not let us use the drops. He was a shelter dog who was abused and will bite when he doesn't like what is happening to him. In order to get a full workup on him, we had to let the vet give him a sedative so she could examine him and take blood samples, etc. He lost his sight 2 days later. She could not fine anything so sent us to a dog ophthalmologist. She diagnosed him with KCS and sent us home with 5 different eye drops to be used 5 times a day. We knew we were in trouble and never got past the first eye. He didn't let us help him. He stopped eating so I started making him homemade food, ground beef, rice and puréed vegetables. All he did was eat and sleep. He shook all day as if he had a fever. He was probably in pain, but never whimpered, just shook, so we would cover him with a blanket. He got very depressed and we thought he would die. We picked him up to go outside after eating, then he would go straight to his bed for the rest of the day. We did not let him sleep with us anymore because he became incontinent. I cried every day. Eventually he got stronger and started exploring the house. We learned what to do with a blind dog and he started getting around by himself. He started going on walks with us and our other 2 dogs. By January he seemed to be back to normal, except for his blindness. Then about a week ago, we were taking him outside to go to the yard at night with a flashlight. He started following the flashlight, a game he used to love to play. We thought maybe that he could see light. The next day we started testing him to see if he was getting his vision back. I noticed that his right eye was no longer cloudy. He started jumping on and off the couch by himself. We got him some steps to climb to get on our bed. This is a miracle to get his eyesight back with no medication. He is better every day and is playing with our other 2 dogs now. Hi, Frannie - Sorry to be slow getting back to you, but I'm delighted that you found a vet who can successfully treat Lucy's dry eye problem by using her own platelets. The technology is called Platelet Rich Plasma (PRP), and it's proven very helpful for bulldogs that frequently have this problem. There is also another treatment using stem cells and PRP. I don't believe it is used for KCS--I haven't seen any mention of it--but it would be wonderful if it could work for that diagnosis too. So glad Lucy's doing okay. It's certainly worth treatment every two weeks at only $25. Thanks for sharing. Hi, my English Bulldog Lucy has suffered so long with dry eye, including infections. For a couple of months we couldn't clear them up enough for her to see. We found vet who drew her blood and spun it to draw platelets? I could be wrong, sorry. I forgot the terminology. But basically used her blood and removed the red cells from it and made a serum for drops. It was a miracle and cleared up her eyes. It only lasts two weeks, but they only charge $25. I use that and her clear eyes drops. I been looking for this medication for my dog for a year now. Reading your story touched my heart,and i learn a lot. We got Lucky 2years ago , he was abuse. He had been from one home to another. I been afraid of dogs all my life, holding lucky changed my life. Thanks so much for getting back to me so soon about Baby! I'll check out drugstore.com to get a cheaper GenTeal. Yes, I'm very concerned that Baby may lose sight in the other eye. I am on a very limited budget, but I will do whatever I possibly can to save her sight. Oh, Mary--I'm so very sad that Baby has KCS and hope she doesn't lose sight in her remaining eye. Using GenTeal frequently can protect her from the pain of corneal ulcers (and she will need it in the sightless eye as well as the sighted one). For quite a while I woke during the night to reapply it to Puppy Girl's eyes because if the eyelids don't close tightly, it dissipates. Forced air heat, air conditioning and fans make the eyes dry out faster, too. Those small tubes of GenTeal don't last long when you're using so much of the lubricant. The best price I found for them was at drugstore.com, with no tax and buying enough at once not to pay shipping costs. It seems to me now (unfortunately, I didn't realize this early in PG's life) that many of the health problems of our pets are due to autoimmune deficiencies caused by too many vaccinations--especially boosters they usually don't even need. Puppy Girl is ten years old now, and for the past couple of years her vet only does titers. I think dogs probably need only initial vaccines--and fewer of those given at once--then titers as long as immunity to those diseases is proven. My thoughts are with you and Baby as you battle KCS and try to save her remaining eyesight. Give her a tummy tickle and a kiss from me. My Min. 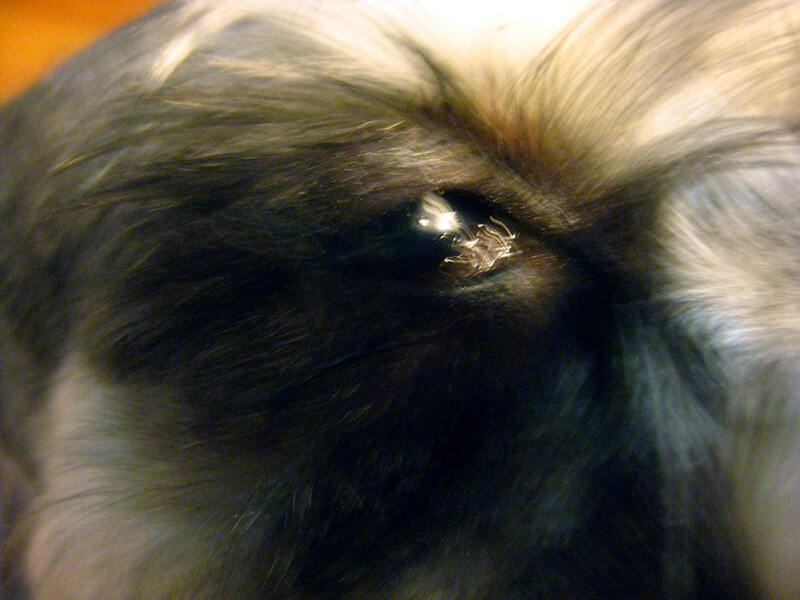 Schnauzer, Baby, has just gone through the same problem with her eyes! I had noticed what I thought was a cataract on one of her eyes; the Vet. said not to worry, it was only a "sunspot". Then the next visit a year later, he tells me she has lost the sight of that eye! I took her to another Vet. for another opinion. He agreed, but also was concerned about her other eye. He referred her to an Ophthalmologist. That Vet. diagnosed her as having KCS , and did several tests, including the Schirimer tear test. I'm like you; I research everything, and from what I read the results of that tear test was not that bad. Hers was 18mm/min 16mm/minOS. He prescribed Pred. acetate, Cyclosporine, and Genteal. Her condition seemed to worsen with all this med. I have discontinued everything except the Genteal. I fear now she may loose sight in that one eye. nchouston - One more comment I want to make about the eye removal. My grandson's Boston terrier had an eye removed last year due to another type of eye condition and has limited vision in the other eye. He adjusted well to both situations--the eye removal and very little vision in the remaining eye--perhaps because he's naturally a calm and placid dog. A dog with a calm temperament probably adjusts more easily than a nervous, excitable dog. By the way, my original response to your comment is further down the screen (after an overdue response to Erica.0 I answered two comments in reverse order within the same section. Erica - Please forgive me for not responding to your lengthy comment right after you wrote, but for some reason I didn't get notice of it. (That happens occasionally.) I'm so sorry your puppy Brandy has KCS. It seems that when the cause is congenital, dogs may get the disorder at an earlier age. GenTeal works well because it clings to the eye and doesn't evaporate as quickly as artificial tears. Still, I have to apply the ointment very frequently to my dog's eyes. The same thing happened to me with pet insurance. Although I've read that pet insurance is good in the UK and other countries, I've decided it's not worth the premiums in the U.S. It's disconcerting to discover it won't cover a medical disorder after you've been paying premiums for a long time, isn't it? Good luck with Brandy, and I hope the cyclosporine and/or tacrolimus will be effective. (There is also a combination prescription of these two drugs that works for some pets with KCS.) For some dogs these meds stimulate the lacrimal glands to produce tears again, but the meds then have to be given for the rest of their lives. However, if they don't work, you'll be using lubricant in her eyes from now on anyway. Thanks for sharing your experiences with Brandy's KCS, and I hope the meds work for her. Please let me know if they do. nchouston - It's heartbreaking that your dog's eye had to be removed, and I understand how difficult it was for you to make the decision. Now that my dog Puppy Girl has gone almost completely blind from chronic KCS, the ophthalmology vet recommends removing her eyes when she can no longer even see light. I can't bring myself to do it yet, though it may have to happen eventually. He says dogs conceal pain, but because I have extreme dry eye syndrome and know the excruciating pain caused by corneal abrasions, it's hard for me to believe my dog wouldn't at least close her eyes if she were hurting that badly. I apply GenTeal PM ointment to both of her eyes every hour or two at the most to keep her eyes from becoming dry. I've even trained myself to awake and apply it during the night. But the decision to have an eye removed is so emotionally painful, and you have my sympathy as your fur baby heals, which I hope he will do very quickly. After heartbreaking consideration, we had our dog's eye removed today for congenital KCS. He is only 10 months but made 0 tears in his right eye. I was ensured over and over again that this was the humane thing to do for our dog, as he was in constant discomfort without having any tears and never responded to any medications. Can't imagine what it would feel like not to have ANY tears in an eye. Very very hard decision. Anyone dealing with same situation? Hello JayeWidsom, so glad I came across your article about KCS. I've been doing research online for weeks now. Here is my story...I have a 6 month old female lab that we purchased from a pet store, first time I EVER did that. Anyway, you would think she would have kennel cough at the very least, no, she has KCS. We purchased Brandy when she was 3.5 months old, perfect eyes, no issues, took video & pix's of her all along. At 4.5 months I notice in her left eye "pink eye", which my dogs have had in the past twice, little gel med, gone in couple of days. Along with the left eye, however, I notice over salivation on her left side of the mouth which is dripping down her neck...seems more watery then salivia. Ok she's also teething at this age so I'm thinking that could be why but I just wasn't feeling it 100%. My vet, who I love dearly, says not sure why over salivation but lets treat the eye, looks dry. 2 months later I have seen 2 different ophthalmologists, have a handful of gels, liquids to administer, eye wash, etc. All tests done...schirmer showed left eye 0, right 17. 10 days later follow up shows left eye 5, right decrease down to 8. why? why is a crooked letter I guess. Bought Genteal and that seems to work the best so far. Was never happy with ANY meds from the vet, I don't even take meds myself. Now the eye vet says Brandy needs: Cyclosporine, tacrolimus, artificial tear ointment, pilocarpine. What worries me is how young Brandy is to have this condition. I too am not going to do surgery and I'm having my regular vet run some blood work to rule out anything serious. I am also thinking of changing her food, trying Bio Tears, someone wrote about using Colloidal Silver (I need to read up on that or ask my vitamin store), I-drop solution, eyes so bright.....etc. I also have pet insurance and guess what....they may not pay (I have $100 deductible). Just received a letter from them last week. LOL. If I do not laugh, I will cry. Someone also wrote about some Chinese herbs they came across that helps dry eye. I'm so confused to say the least. Midget--She's very patient with me regularly cleaning her eyes and putting ophthalmic lubricant in them every few hours, day and night. I'm lucky that I'm retired and don't have to ever leave her more than two or three hours, and keeping her eyes from drying out protects her cornea and helps prevent pain. I realize Puppy Girl is very lucky to have good, caring vets. I'm sorry you're having a problem finding a skilled vet there. If your dog experiences extreme dry eyes, you can buy GenTeal Nighttime Ointment (made for humans, but recommended for dogs by vets as well) from www.drugstore.com. I use it for my dog in the daytime, too, because it keeps the eyes lubricated longer than drops or gels. Puppy Girl is really tolerant of the pain that eye must've given her. Looks as though the compress is really helping in that photo. I wish dogs could get better eye treatment here in Singapore.....vets here are not too skilled. Thanks for sharing!! Cielosim--Thanks so much for sharing your personal experiences with your chow. I may try the Paralube since it's less expensive than the Genteal, but (so far, and we've been using it quite a while now), the Genteal works well for her. It just costs so much, and she goes through so many tubes because I have to reapply it during the day and evening. Tacrilimus didn't work for my dog, and the vet said that her problem is undoubtedly immune-mediated, probably because of a severe reaction she had to a vaccination. At this point, I'm treating her only with Genteal and cleaning her eyes multiple times during the day, before bedtime and first thing every morning. Her eyes are staying open, and are much clearer than they were for a while. Taking care of her is time-consuming, but I love her so much that I don't mind. I just call her my "high-maintenance doggy." Thanks for reading. Good luck to you and your chow. Thanks for reading, midget38....Dry eyes can be very painful for dogs, especially when the tear glands no longer make tears at all. It's important to keep the eyes lubricated with eye ointment and not let them dry out and cause an ulcer on the cornea. P. S. Your dog is adorably cute! Dogs can certainly develop eye conditions with the way they tend to sniff the ground or interact with unhealthy substances when we're not watching. Thanks for sharing this-excellent! She had an appointment with the vet yesterday for a check-up. I could tell her eyes were bothering her all morning, so wasn't surprised when Dr. Thrash told me she couldn't use the Schirmer test, even though she tried for a long time, because PG slammed her eyelids shut every time she saw the doctor's hand coming toward her face. Dr. T checked her corneas and said they looked better than last time, so that was encouraging. Puppy Girl and I will continue to take each day as it comes. I'm so glad I can be home with her nearly all the time, which is another reason to keep myself healthy! I read both parts of your pup's saga. My thoughts are with you both. She is a brave and beautiful pup who has a wonderful mom. I have gone through some pretty serious medical issues with my fur child, so I know how gut wrenching it is to see them suffer. I am happy the medication and your care provides some relief for Puppy Girl. Thanks for sharing her story. Thanks, Ann....That's what I'm doing now--putting money aside for Puppy Girl instead of paying a premium for worthless pet insurance. I don't expect to have any $$ left over, however; her checkups and expensive medication refills are frequent. Her face has to be shaved twice in between regular grooming visits, too. Her eyelashes grow so fast, and it's very difficult to get drops in her eyes when they're long. One veterinarian I worked with would tell people that rather than buying pet insurance they should just start a savings fund for their pet. That way if something happened they would have money available, and if their pet lived a healthy life, they would still have some money. Great story. Hi, Dr.Mark....The worst thing about the pet insurance fiasco was that I've been paying the premium for a year thinking it was their best policy (because that's what the phone sales rep told me). Actually, it turned out to be a policy the company was phasing out...not that their other policies don't have these ridiculous caps. Even worse, they don't publicize them, and they aren't written into the printed policy that was mailed to me. I needed a customer service "guide" to get through the maze on their website and find this information. It's hidden for a purpose! It seems that they pay for freak accidents, but not much for the usual diseases that dogs have. I thought I'd done my research before choosing that company, but I didn't have the right information. Too late now. She now has a pre-existing chronic condition that even a good (by that, I mean "ethical") pet insurance company would not cover. I'll just have to include her regular meds in my budget from now on. I couldnt believe that comment about a $120 limit for KCS! That wasn´t even enough to cover the cost of cyclosporine when it came out back in the early 90s. Good thing you cancelled that policy. Thank you, Dr.BJ....I do love my Puppy Girl, but she gives back love to me in full measure. She doesn't care what I look like , how old I am or even if I'm cranky! Aren't dogs wonderful? Aren't we humans fortunate to have them in our lives? Jaye - Your love for your sweet Puppy Girl shines through every word you write. You are a wonderful 'mommy' and I'm certain that with your loving care and devotion, every day she will be closer to her before-KCS behavior. Yes, she's a member of the family, Paula, and a sweet girl. And I understand your cousin's willingness to spend that much for saving his Sheltie's life. (Shelties are also very sweet and smart dogs.) There is one pet insurance company in the U.S. that gets a five-star rating by a consumer reporting agency, but--alas--I didn't know about it when I enrolled PG in the other one. My intent was to have her covered in the event of either a serious acute illness that required surgery or other expensive treatment, or for a chronic problem (such as what she has) that would require continuing treatment. I realized my mistake the hard way. (But I think there's a hub in that, don't you? I'd like to warn others not to trust this particular pet insurance company, which advertises all over the Web.) Reputable pet insurance has been around in the UK for quite a while. Wouldn't you know that when it finally begins to catch on in the U.S., the ethics take a nose-dive? Thanks for reading and for your kind words about my fur-baby. Jaye....I'm glad you wrote an up-date on puppy girl. The lengths we will go for our fur-babies! My cousin once shelled out over $5000.00...yes, that's five thousand, to save his Sheltie's life after she was viciously attacked by a neighbor's dog. But...the bottom line is, they ARE members of our family. I am impressed and amazed how PG will lay still and patient when you cover her eyes with a compress. What a sweet, calm and gentle dog she is!